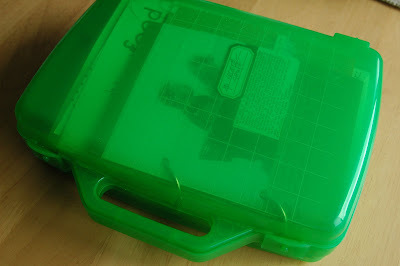 For art journaling on the go - I use this green box (approx 7.5"x11"x 2.5") that I bought from Michael's one day for about $4CDN. This is what's inside the box: (clockwise starting from top left) scrap paper for journaling on/label stickers, Evalicious and other small loose embellies, small alphabet stamps, ink pad, double sided adhesive, Sakura Microperm journaling pen, Honeybee scissors, washi tape and mini photos. 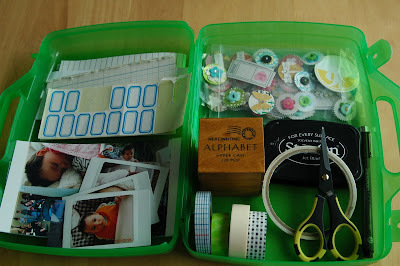 **Edited: blue label stickers are a flea market find:). 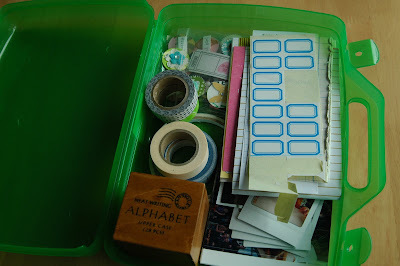 Included some in the Vintage school days art journal kit. Just found some more in my stash and will put it in future everyday aj kits:). Items all stacked on top of each other (strategically:P) on one side of box. Then in goes the art journal itself too. Close lid and I'm ready to go! Love that it has a handle! What a great idea. I love seeing what others keep in their tool boxes. It's like taking a peek into their closet. Thanks for sharing. That is great so is your site. 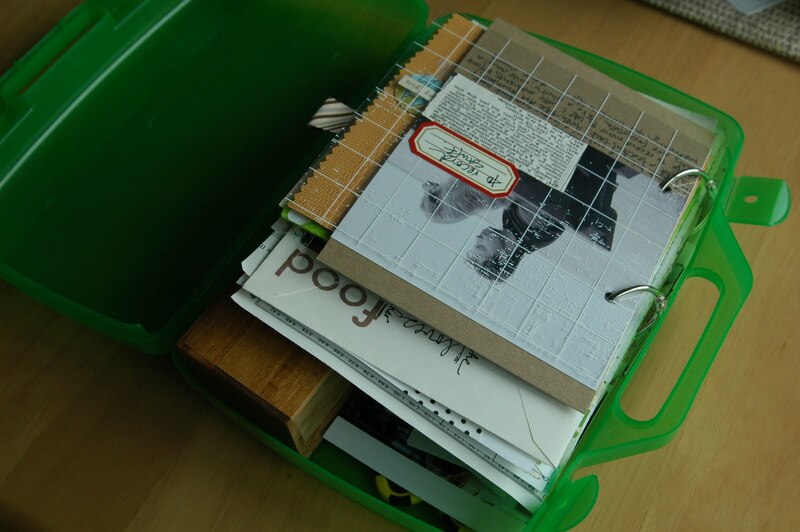 I'm wanting to make a journal for my hubby like this because of his brain injury. Just stopping in from vancouver mom to say congrats on your nomination!